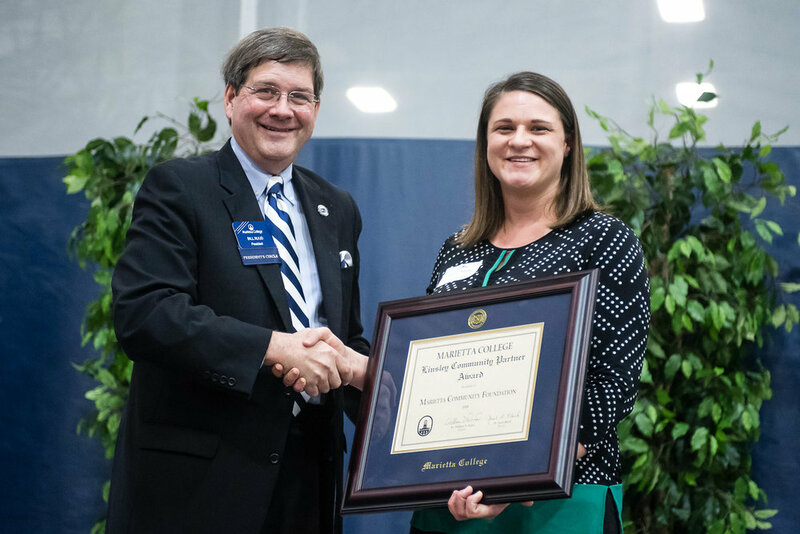 During the 2018 Founders Day Ceremony, Marietta College recognized faculty, staff and community members with a variety of honors and awards. The Marietta Community Foundation was among those recognized, receiving a Linsley Community Partner Organization Award for their continued partnership with the College. Since its establishment in 1835, Marietta College has been a source of transformation for our city, county, and region. The institution has touched many lives and inspired in its students, graduates, employees, and the community a thirst for knowledge and the drive to make a difference. The Marietta Community Foundation has had the pleasure of partnering with Marietta College for more than 20 years. When the Foundation was reactivated in the mid-90s under the leadership of Robert Kirkbride, Marietta College hosted the Foundation’s office on campus and assisted with administrative needs. Over the years, College leadership, staff and alumni helped the Foundation grow to what is has become today. Since 1995, the Foundation has worked with the College to award more than $465,000 in grants and donor advised donations to college programs and projects. Through designated funds like the Anonymous Charitable Lead Trust and the Snediker Funds, annual gifts to the college are made each year. Through Donors Advised and Unrestricted Funds, the Foundation has contributed to a number of major projects, such as the construction of the Planetarium and the renovation of Don Drumm Stadium, as well as programs like the Pay It Forward Program and Nonprofits LEAD. Last year, the Foundation partnered with Marietta College to help fund the purchase of American Flags to hang throughout Downtown Marietta thanks to generous alumni. This year, grants include the award for the Jr. PioPitch Competition for area high school students, encouraging entrepreneurialism and creative problem solving. As this partnership grows, the Foundation and its donors look forward to finding new ways to contribute to projects that enhance our local educational and cultural assets.